This is a great summer dish and is easy to make. 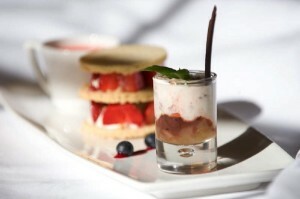 At Rudding Park, we use strawberries and gooseberries from Spilman’s Farm near York. 2 punnets of local strawberries washed, hulled and sliced. Whip the cream, caster sugar and vanilla in a bowl until stiff and then place the mixture in a piping bag. Place a blob of cream in the centre of each plate and place a disc of shortbread on top. Swirl the Chantilly cream over the disc and then placed the sliced strawberries on the top and repeat this process for the next layer. Put 250ml of water and 250ml caster sugar in a pan and boil until all the sugar has dissolved. Pour over the strawberries immediately. Blend together with the yoghurt using a small stick blender and pass through a sieve. Serve chilled in an espresso cup. Place the fruit in a small pan with 80g caster sugar and cook until stewed and soft. Place most of this in the base of four shot glasses and allow to cool, reserve a little for the rest of the dish. Add 200ml white wine to the remaining 20 g caster sugar, split the vanilla pod and add the seeds. Add the gooseberry and elderflower jam, double cream, lemon zest and the remainder of the fresh gooseberry mix. Whisk this until stiff and pipe into the glasses. Set in the fridge for ½ hour. This dish looks great on a long thin plate. Place the Strawberry Shortcake in the centre of the plate, then place the syllabub shot glass at one end and the espresso cup of Strawberry Soup at the other. Chef’s tip: To stop the espresso cup and shot glass slipping about on the plate, put a blob of syllabub underneath them, this will hold them in place.